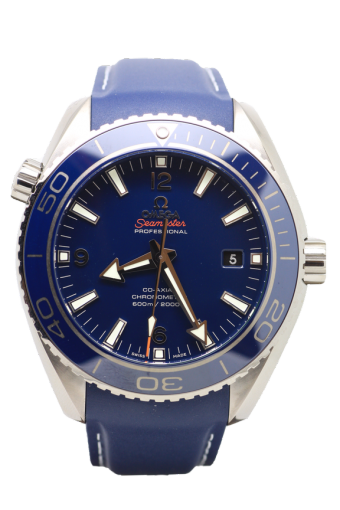 The Omega Seamaster Planet Ocean liquid metal 600m Diving watch features both date and helium valve functions. A 45.5mm watch case in titanium has a blue ceramic inset rotating bezel and houses the co axial movement . The matching blue rubber strap with a titanium deployment clasp completes the watch perfectly. The Cheshire Watch Company are supplying this watch complete with all boxes and Paperwork which is dated 2016 and still unworn from new.